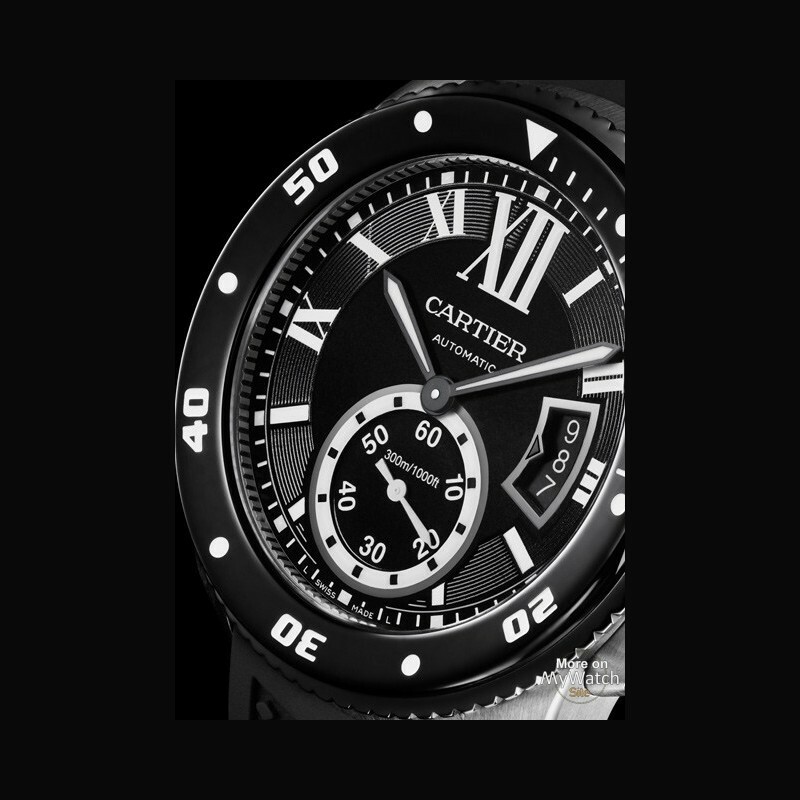 With its powerful lines, rugged case and original architecture, the Calibre de Cartier watch, launched in 2010, is the new symbol of confident masculinity. Its dial boldly reinterprets the Maison’s design codes, such as Roman numerals and a flanged bezel, that clearly identify it as a Cartier model. 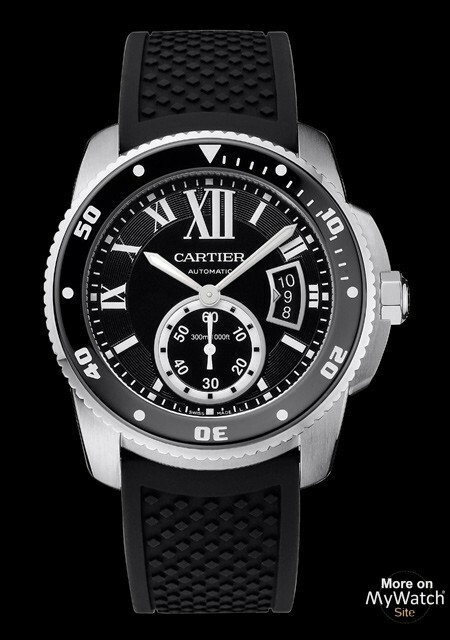 In 2014, this Manufacture watch opens a new chapter with a diving version: the Calibre de Cartier Diver. An unmistakeably masculine watch for both everyday wear and extreme conditions, it meets the challenge of combining Cartier style with the technical requirements of ISO 6425. This norm, which controls the “Diver’s Watch” label, lays down eight criteria of reliability and imposes a series of extremely rigorous tests. A unidirectional bezel, water-resistant to 300 metres, hands and dive-time indicator in superluminova: the Calibre de Cartier Diver meets all the criteria for a diver’s watch as laid down in the international standard, entitling it to carry the engraving “Diver’s watch 300 m” on the case back. 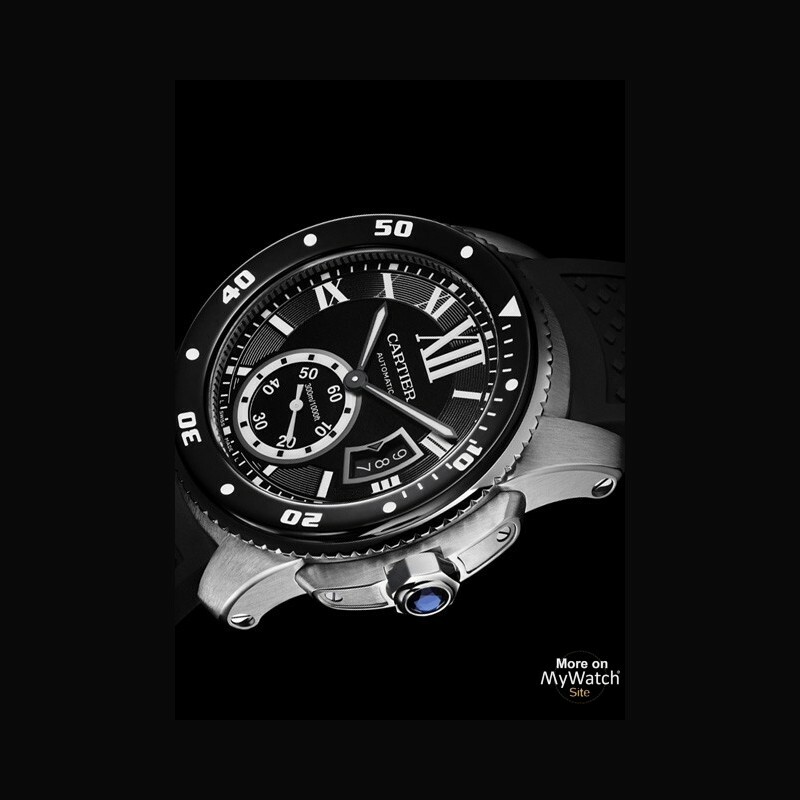 To prevent any accidental rotation or alteration of the dive-time indication, the bezel turns in one direction only. It has been designed with 120 notches (40 teeth and 3 points) to enable adjustment to a half-minute, with a clear sound signal during its rotation. For greater visibility, the markers signalling each 5 minute period are clearly indicated. 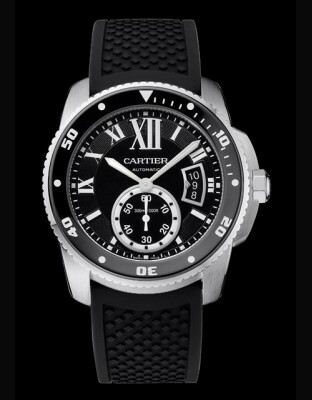 The Calibre de Cartier Diver can be clearly read deep below the surface due to the superluminova applied to its dive-time indicators, hour and minute hands, pre-selection device and small seconds counter. 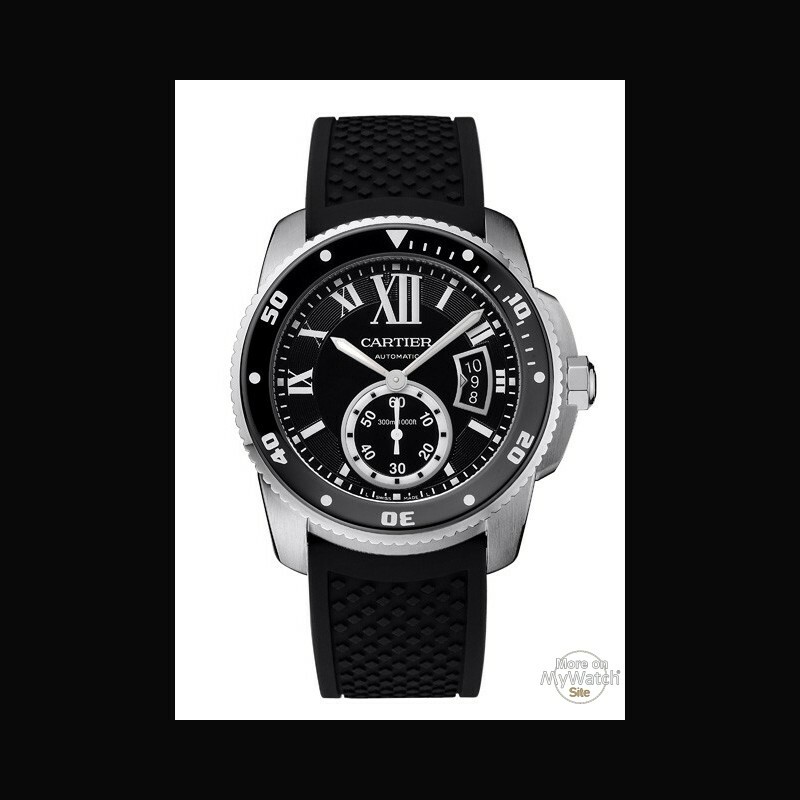 When underwater, diving watches can be subjected to very high pressures and extreme conditions (salt water, thermal shock, etc.). 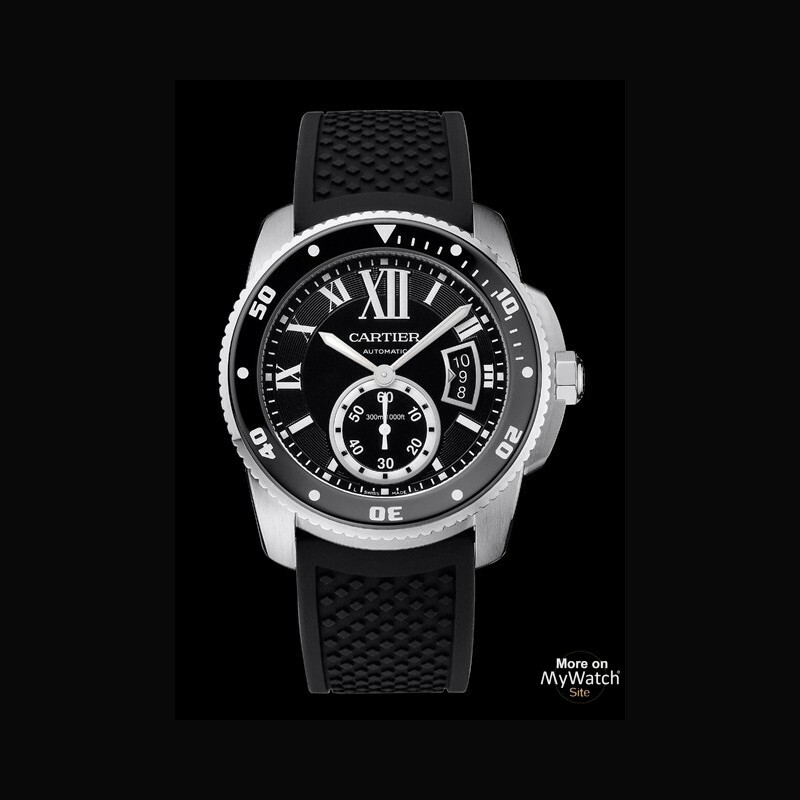 For protection, the Calibre de Cartier Diver is fitted with a thick crystal, a screw back, oversized seals and a screw-in crown that ensure water-resistance to 300 metres. The watch has demonstrated its resistance to salt water after immersion in a solution of sodium chloride (30g/l) at 18°C - 25°C for 24 hours. Furthermore, after spending 50 hours at a depth of 30 centimetres at 18°C - 25°C, it continues to function perfectly under water. The Manufacture’s watchmakers are always careful to maintain a balance of dimensions. 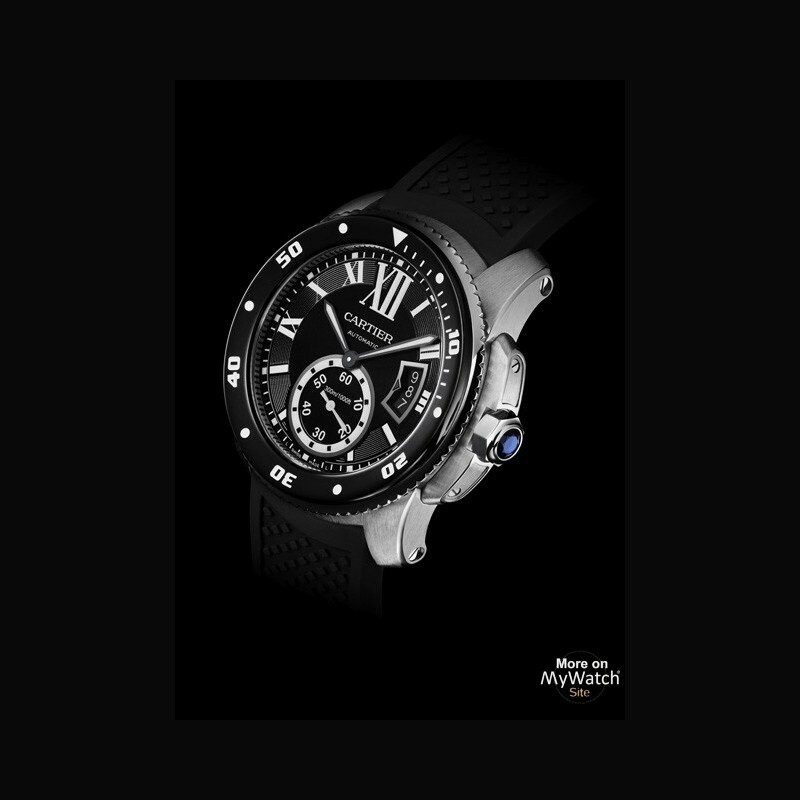 They have produced an authentic diver’s watch, without sacrificing everyday comfort on the wrist, in a balanced case measuring just 11 mm in thickness. It is a brilliant combination of a diving watch and beautiful Cartier watchmaking, with a striking contrast of satin and polished finishes, a turning bezel coated with ADLC and bordered with fluting that recalls the interior of the bezel of the Calibre de Cartier watch. This is a clear sign of its pedigree, just like the oversized, luminescent XII numeral. In the all-steel or pink gold versions on a black rubber strap, the Calibre de Cartier Diver shows all the characteristics of the very first Calibre de Cartier model created in 2010. It has the same powerful shape, robust case and Manufacture movement 1904 MC. 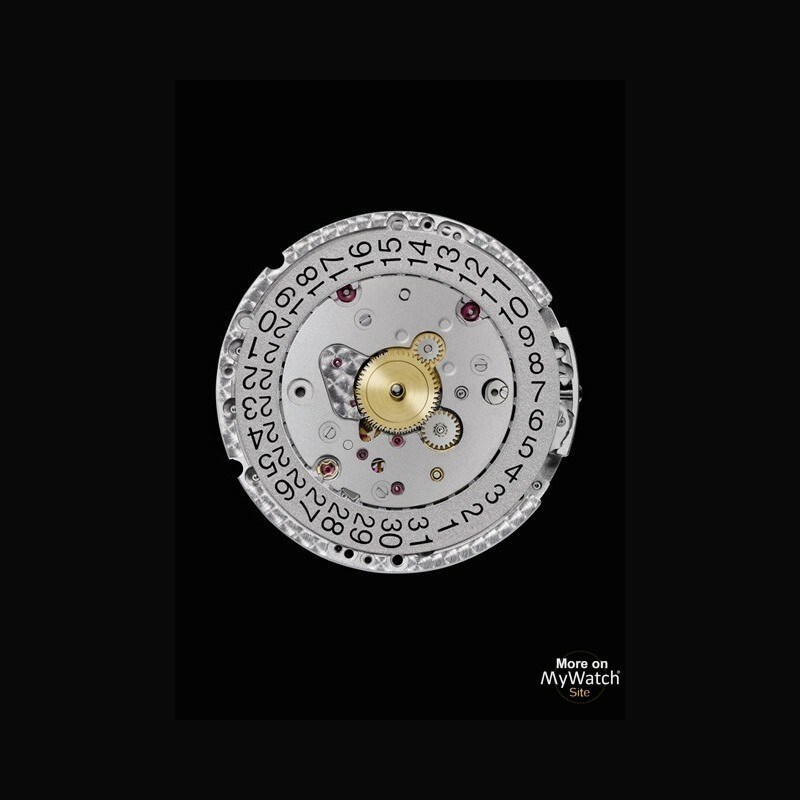 Introduced in 2010, the 1904 MC was the first self-winding movement to be developed and assembled by Cartier’s watchmakers. Its highly symbolic name recalls the pioneering spirit of Louis Cartier who, in 1904, created one of the very first modern wristwatches for his friend, the pilot Alberto Santos-Dumont. 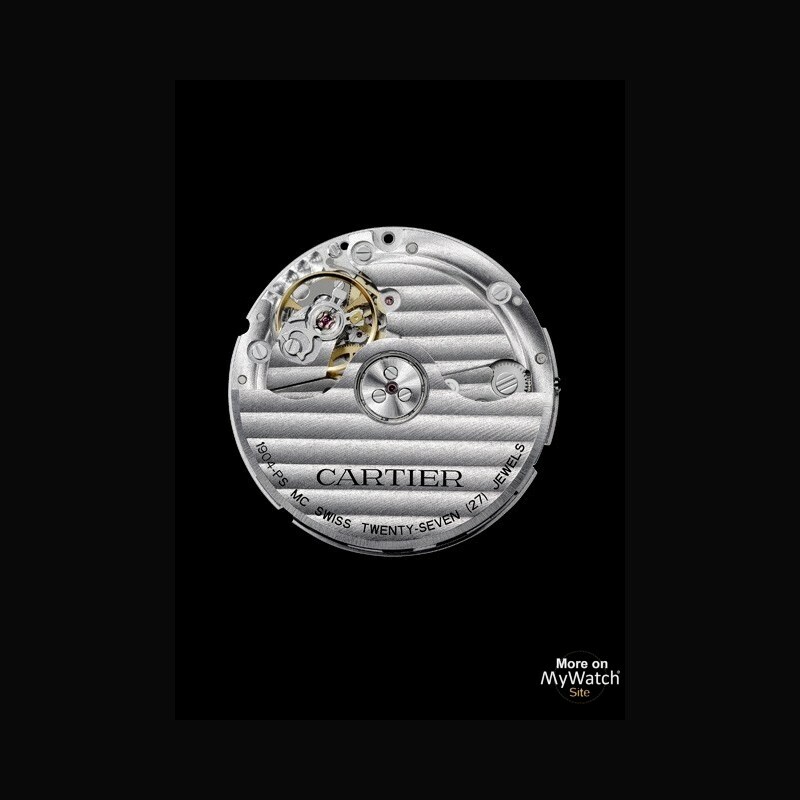 More than a century later, the 1904 MC movement is writing a new chapter in Cartier watchmaking. This 11 ½ ligne calibre has been designed to maintain perfect chronometric stability thanks to a double barrel that guarantees excellent constancy of the mainspring torque over a long period. Fitted with a fine regulating system and a stop-second mechanism, it has been conceived to enable the Manufacture to perfectly adjust its chronometry, guaranteeing that it runs with great precision. The rotor of the 1904 MC calibre is mounted on a central ceramic ball-bearing that gives it excellent shock-resistance and ensures its durability. An even more inventive development is a ratchet system of bidirectional winding that makes the watch quicker and more comfortable to wind. The decorators’ endless quest for beauty produces the most impressive results in fine watchmaking movements. The care lavished on the finishes of the calibre 1904 MC demonstrates Cartier’s extremely high standards when creating a movement to power a watch intended for professional use and everyday wear: the Calibre de Cartier Diver.